Awesome news from California: Governor Brown announced a major greenhouse gas reduction target of 40 per cent reduction on 1990 levels by 2030. This matches Europe's commitment. California is the largest economy in North America and the 7th largest economy globally. It is a significant announcemewnt and goes much deeper than President Obama's national target of a 26-28% emissions reduction on 2005 levels by 2025. "With this order, California sets a very high bar for itself and other states and nations, but it's one that must be reached - for this generation and generations to come," said Governor Brown. The long term target is reducing emissions 80 percent under 1990 levels by 2050. The order also includes instructions for maintaining and updating the state's climate adaptation strategy, Safeguarding California, and ensure that its provisions are fully implemented. Climate change impacts and predictions will also feature in State Agency planning and investment decisions and full life-cycle cost accounting, and Infrastructure planning. In January 2015 at his inauguration Governor Jerry Brown announced that Climate Change action would be prominent for his next 4 years of his administration. With California already on track to meet it's target of a third of electricity from renewable sources by 2020. Brown announced that this should increase to 50 per cent of electricity generation by 2030, plus a 50 per cent reduction in petroleum use in cars and trucks, and to double the efficiency of existing buildings, and use cleaner heating fuels. But it is not all smooth sailing as his administration has come in for criticism over support for fracking, and the continued allocation of water during the 4 year long drought for fracking. "Gov. Jerry Brown deserves credit for this important step toward fighting global warming, but the governor continues to undermine his own plans by backing fracking,” said Kassie Siegel of the Center for Biological Diversity’s Climate Law Institute media release. “Fracking pollution threatens to blow a huge hole in California’s target for reducing planet-warming emissions. No plan to prevent climate disruption can succeed if it doesn’t include a rapid transition away from fracking and other dangerous oil and gas production." Scientists from the Climate Action Tracker calculate that developed economies must make substantial cuts in emissions to help prevent more than 2 degrees Celsius of warming, with targets by industrial countries of at least 35 percent to 55 percent below 1990 levels by 2030 to do their fair share in avoiding a climate catastrophe. The CAT has calculated from the IPCC AR5 scenarios that reductions for the Annex I countries in 2025 and 2030 should be 25-55% and 35-55% below 1990 levels respectively for an equity scenario based on relative capability to mitigate. 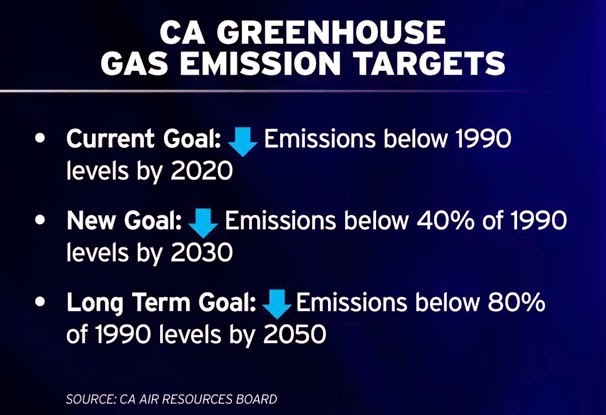 1.A new interim statewide greenhouse gas emission reduction target to reduce greenhouse gas emissions to 40 percent below 1990 levels by 2030 is established in order to ensure California meets its target of reducing greenhouse gas emissions to 80 percent below 1990 levels by 2050. 2.All state agencies with jurisdiction over sources of greenhouse gas emissions shall implement measures, pursuant to statutory authority, to achieve reductions of greenhouse gas emissions to meet the 2030 and 2050 greenhouse gas emissions reductions targets. 3.The California Air Resources Board shall update the Climate Change Scoping Plan to express the 2030 target in terms of million metric tons of carbon dioxide equivalent. -Identify a lead agency or group of agencies to lead adaptation efforts in each sector. -Report back to the California Natural Resources Agency by June 2016 on actions taken. 6.State agencies shall take climate change into account in their planning and investment decisions, and employ full life-cycle cost accounting to evaluate and compare infrastructure investments and alternatives. -Natural infrastructure solutions should be prioritized. 9.The Governor's Office of Planning and Research will establish a technical, advisory group to help state agencies incorporate climate change impacts into planning and investment decisions. 10.The state will continue its rigorous climate change research program focused on understanding the impacts of climate change and how best to prepare and adapt to such impacts. This Executive Order is not intended to create, and does not, create any rights or benefits, whether substantive or procedural, enforceable at law or in equity, against the State of California, its agencies, departments, entities, officers, employees, or any other person. "This is a bold ambitious action on the part of the Governor, but it is also is a critical step for the state of California because the science and data shows that we need to steeply reduce our carbon emissions in order to protect our quality of life." said Nicole Capretz, spokeperson for Climate Action Campaign in this KPBS interview in San Diego. "California and Governor Brown have clearly understood, internalised and articulated the science of climate change and today have aligned the state to the growing global understanding of the step changes and strategies needed over the coming years and decades,” Figueres said. "California’s announcement is a realisation and a determination that will gladly resonate with other inspiring actions within the United States and around the globe. It is yet another reason for optimism in advance of the UN climate conference in Paris in December." Climate change is already driving most Californian native freshwater fish species to extinction. Coastal areas are also expected to be hit hard by sea level rise with climate change. The climate targets come after California has introduced mandatory water conservation restrictions with much of the state in extreme drought that has gripped the state for four years. "Californians have to get used to a very different world and we are going to have to live very very differently" said Brown in this PBS News Hour interview. The US southwest occasionally experiences multi-decadal megadroughts. The last two occurred during the 2nd century and the 12th century. While these megadroughts may have been caused by natural climate variation, human driven climate change will increase the frequency of extreme droughts ocurring. I wrote about this possibility back in September 2012: Climate change driving US Drought conditions towards a megadrought? As Naomi Klein makes clear in this March, 2015 Guardian article everything changes with climate change.